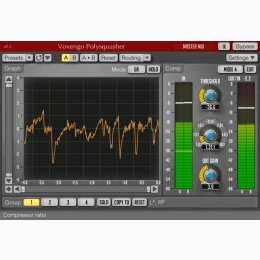 Voxengo Polysquasher is a mastering compressor for professional audio and sound production applications. Polysquasher was designed with a main goal: to be transparent. Transparent compression action is a cornerstone for any mastering compressor. Transparency of audio signal processing is necessary to preserve all existing elements in the mix, while compression itself is necessary to make the mix sound uniform to other mixes (tracks) and to make it sound more solid and “glued”. 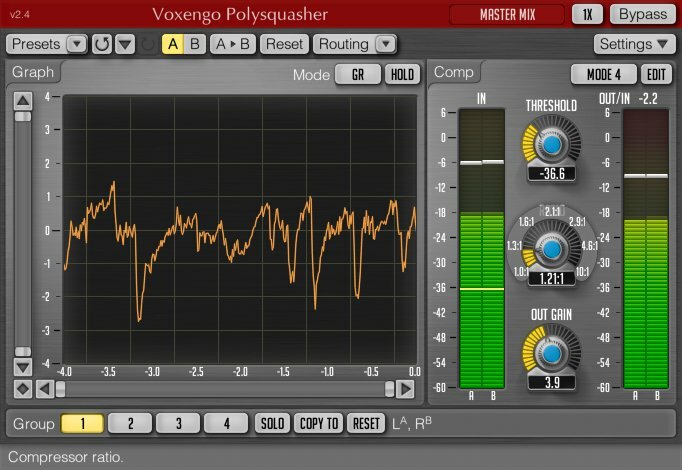 Polysquasher achieves its goal by using a unique compression algorithm which requires a small number of parameters – basically threshold and ratio only – making this compressor a joy to use. More advanced settings are hidden in the “compressor mode editor” panel where you can create your own compressor modes that can be easily recalled later. Polysquasher is best used as a finishing compressor inserted in the chain before the final mastering limiter. Polysquasher also features real-time gain reduction and waveform graphs. Full multi-channel operation is supported. Plugivery is an official distributor for all Voxengo's products.